Mezcal mary with roasted jalapeno bacon! A smoky-hot twist on the classic Bloody Mary! Smoky mezcal replaces vodka in this jalapeño-spiked take on the classic Bloody Mary. Served with a crisp Bacon swizzle stick, it's the kind of savory, spicy cocktail that's equally at home on the brunch or dinner table. 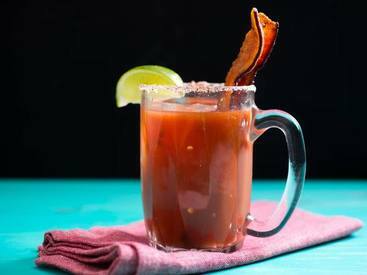 Why This Recipe Works- smoky mezcal and crisp Bacon emphasize the drink's savory qualities. Roasted pureed jalapeno adds a complex, fruity heat.